Stef Craps is a lecturer in the English Department at Ghent University. He holds a licentiate and a PhD from Leuven University and an MA from Hull University. Apart from this monograph on Graham Swift, he has published various articles and book chapters in the fields of modern British and postcolonial literature, trauma studies, ethical criticism, gender and queer theory. This book offers a critical reading of the novels of Graham Swift in light of recent developments in literary theory and criticism. It shows how the novels elaborate an ethics of alterity by means of a detailed study of one of Swift’s most persistent and fascinating – yet all too often ignored – concerns: the traumatic experience of reality. Swift’s texts evoke the cultural pathologies of a nation (post-war Britain) and an era (modernity) through the narratives of individual characters who are struggling to come to terms with a traumatic personal and collective past. This study charts the entire trajectory of Swift’s engagement with the perils, pitfalls and possibilities of navigating a post-traumatic condition, proceeding from an emphasis on denial in his early work, through an intense preoccupation with the demands of trauma in the “middle-period” novels (including Waterland), to a seemingly liberating insistence on regeneration and renewal in Last Orders and The Light of Day. By providing a wide-ranging and in-depth analysis of Swift’s novels against the background of the “ethical turn” in literary studies and the emergence of trauma theory, this book extends and enriches our understanding of what is arguably one of the most significant literary oeuvres of the late twentieth and early twenty-first centuries. Understatements have certainly become Swift’s speciality, resounding throughout his fictions of ethical consequence illuminated by Stef Craps in this valuable new study. Craps’s approach is far from pedestrian. Within its single-author format, what makes this book distinctive is that it proceeds chronologically while working hard to focus its thematic coverage, distinguishing itself from a standard text-by-text exposition. This excellent book is a detailed, carefully balanced and well-informed study of this major contemporary writer. Most impressively, it has a strong grasp of both the complex currents of Swift’s fiction and of current debates in literary studies and theory over issues of trauma and ethics. Indeed, Stef Craps’ luminous and detailed study, while more than this, could be seen as a case study for the effectiveness of these ideas for understanding a major contemporary writer. Certainly, it will shape how Swift’s writing is understood. This book not only offers brilliant analyses of Swift's novels, it also makes a significant impact on trauma studies. Craps argues that traumatic histories are the central themes in Swift’s literary oeuvre. But more importantly, he demonstrates that Swift’s own medium – storytelling – is crucial in working through trauma. 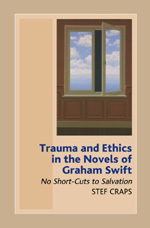 Working across the fields of ethical criticism and trauma theory, this volume offers a detailed and innovative study of the fiction of Graham Swift, providing perceptive readings of all his major novels. . . . overall, this is a clearly argued, intelligent and engaging study, which makes valuable contributions both to the field of trauma studies and to Swift criticism.